Thank you Dad, for that first dollar spent to to buy me a pony ride. For building me stables for my toy horses. And for listening to the gushing enthusiasm of a nine-year-old describing every detail of every horse I saw. even if you wouldn't let me bring a horse home for the winter. even if you probably knew it wasn't going to make this 'horse thing' go away. and each of those that followed. and the perfection of a summer day. as you drove the trailer, hauled the water buckets and held the horse. and oh yes, reminded me - yet again - to shorten my reins. for the horses and their people. and to make riding more fun for everyone. when any of our horses was injured or sick. when any of them were lost. Thank you Dad, for going 'all in' with me. and enough wonderful memories to last all of my days. The horse world is full of lovely, talented riders in all disciplines - but the number of horse owners and riders who qualify as 'horsemen' seems to be shrinking all the time. There are several contributing factors to this change. More horses are boarded where professionals are responsible for their care, so riders don't have the need to be as 'hands on' as they once did, and in some cases are discouraged from participating in the care and decision-making process. People don't seem to have as much time to spend in the stable learning about horse management and practicing those skills, and finally, it seems to be harder to find knowledgeable horsemen with the time, ability and desire to pass along what they know. As long as the horse is well-cared for, it really doesn't matter who is looking after him - but if you are the rider or an owner who wants to become more than that, here's a 'Top Ten' list of skills (in no particular order) you will want to add to your 'toolbox' on the road to becoming a horseman. When done correctly - which requires some instruction and practice - longeing is useful training tool, or can be used to allow the horse to work off a little excess energy before being ridden, or to evaluate soundness. Simply allowing the horse to run around at the end of a long rope does not qualify! Not rocket science, but 'reading' a dirty stall can give you clues about your horse's stress level and digestive health and whether he is eating and drinking well. Whether you do it on a daily basis or not, you should be able to set up a clean and safe stall and efficiently maintain it. At a minimum, you should know what your horse's resting temperature is and what his pulse and respiration rates are. Early signs of illness, including colic, should be recognizable, and you will want to be able to detect lameness and determine whether it requires professional attention. Basic saddle fitting skills are necessary to ensure your horse is comfortable in his back and that horse and rider are in good balance to progress in their training. Trimming the muzzle, ears and fetlocks is a routine part of grooming for many horses. Being able to clip around wounds or skin problems is required at times, and the ability to do a body clip will save you money and enable your horse to train more efficiently in very hot weather and to prevent the sweating/chilling cycle on a horse who works regularly in the winter. You should have some knowledge about equine feeds and understand what your horse is eating, how much, and why - including the type and quality of hay being fed and any supplements that are added to the diet. Horsemen should be adept at applying stable bandages for use in the treatment or protection of a wound or injury (or simply for support), as well as shipping wraps, polos, and hoof bandages. You should be comfortable loading and unloading, and securing your horse in a trailer or van. An understanding of the safety issues that go hand in hand with the transport of horses, including ventilation, hydration and safe driving tactics, are all part of good horsemanship. 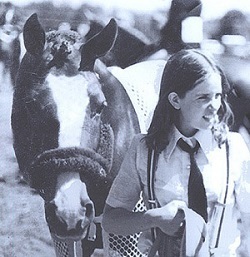 Not everyone has the skill to braid an 'A' show hunter, but a good horseman should be able to correctly prepare a mane and do a presentable job of braiding using at least one of the various techniques. The bit is one of the most important tools of communication with the horse. You should know how the various classes of bits work, be able to fit and adjust them correctly, and be able to evaluate whether the one you are using is comfortable and effective. Grooming the horse, tacking up and cleaning tack have not been included, as these are basic skills all riders should be able to do in a confident and capable manner. The above list could be considered the hammer, screwdriver and wrench in a horseman's 'toolbox' - adding different tools, or varieties of the ones you already have, along with experience, are what will make you a more capable horseman. It’s too expensive. It’s too far to drive. It takes up too much time. It’s too dangerous. Yes, those are pretty compelling arguments against getting your son or daughter involved in horseback riding – until you dig a little beneath the surface and discover the enormous and unique benefits an involvement with horses can bring to your child’s life…and not just for now – forever. Most kids who take up riding do so because they love horses (or think they do). This seemingly irrational passion that many of us share for these animals is a subject for at least another article (perhaps even a PhD thesis! ), and while it can be difficult for a ‘non-horsey’ parent to fathom, it can be strong enough to outweigh the initial concerns regarding the expense, time required and perceived dangers. One of two things generally happen after a ‘horse-crazy’ kid starts riding – they quickly find out that horses are considerably more complex to operate than it appears on t.v. ; they are dirtier, bigger, and require a level of commitment that is beyond the rider’s interest level, OR (brace yourself) they discover they love the challenge and rewards offered by the human-equine relationship and you are destined for a life of standing around dusty riding rings and marveling at the absolute joy and enthusiasm that is generated by these creatures. If this is the case, don’t despair. Your child has now embarked on a possibly life-long journey that can reap tremendous rewards in physical, intellectual, and emotional growth. Almost any sport requires a level of cardiovascular and muscular fitness, along with some degree of balance, coordination, strength, speed and flexibility. While someone who rides well makes it look effortless – it’s not! An hour-long ride can burn similar calories to a 30 min jog or a 60-minute bike ride. Riding is very helpful in stretching tight or spastic muscles, it requires good balance, strength of core muscles and the coordination of eyes, seat, hand and leg aids.Visual and spatial perception is also required to ride effectively. Many of the psychological benefits of riding can also be achieved participating in other sports or activities. The value of teamwork; the self-discipline to do the training outside of formal practices or games; an increase in self-confidence as skills grow; the personal organization required to fit training, practices and competitions into the rest of a busy schedule, and the perseverance needed to keep trying when one is not successful in their efforts are all valuable skills kids can learn and strengthen through any number of team and individual sports as well as through horseback riding. It is from the psychological and mental perspective where interaction with horses and riding can produce growth in less common ways which can contribute toward the development of character traits I believe our society could use more of. In general, riding a horse is an individual, rather than a team sport – yet the horse and rider must work together as one. Communication is a fundamental requirement of any team sport, and this is absolutely the case in riding. The challenge here is the horse and rider are from different cultures and speak different languages! The rider has to learn to give the horse an instruction, analyse the response, and either reinforce the right reaction or figure out a different way to ask for the correct response. 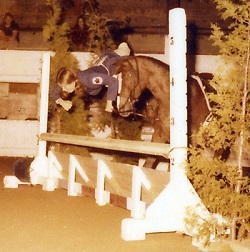 This requires very quick evaluations and corrections at times, and considerable self-discipline and emotional control, as the horse doesn’t know that it’s really, REALLY important that he trot this circle in exactly this spot at exactly this speed – he must be given directions (aids) that make sense for him to do what is required, and time to comply. Momentarily losing one’s temper during a soccer game rarely affects the outcome of the game; losing one’s temper or patience does not make things clearer to the horse and inevitably things go from bad to worse quite rapidly – and often for a considerable period of time. The good rider must respect the horse’s different point of view, and will appreciate that patient, methodical training normally pays off. They will also learn that, despite doing everything ‘right’, the horse is a separate, thinking, feeling creature who may be distracted, tired, or simply not cooperating, and things may not go as well as anticipated. A rider needs to understand that fundamentals are hugely important to long-term success, and while small improvements should be happening frequently and are very rewarding, the ‘instant gratification’ that too many people expect is not one you should anticipate when learning to ride; patience, emotional control, and perseverance will be key – and helpful attributes for success in school and later in life. Riding, training and competing also teaches children about responsibility. When first starting to ride, the coach or instructor will be making virtually all the decisions for the horse and rider, but as the rider progresses, they will begin to take responsibility for the horse`s performance, and ultimately his welfare. 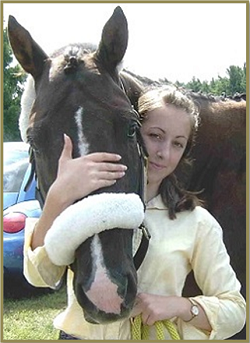 Teenagers and young adults who become horse owners will understand about putting something else`s needs ahead of their own, and how their horse`s well-being is dependent on their commitment and the choices they make. Finally, riding can be a life-long adventure. Most children can begin lessons around the age of eight, and as long as you can still get on and off the horse, there is no limit to how long you can enjoy the sport. The learning continues as well – every horse is different and every ride offers a new puzzle to solve. Every sport requires an input of time and money, and most contain an element of risk. But I can think of no other sport that combines the mix of physical and mental challenges that riding poses, along with the incredibly rewarding relationship that develops between horse and rider. When I finished my last Event in mid-September, I breathed a big sigh of relief. It had been a long season and I was tired! Tired of juggling work schedules; tired of the clashes over the disruption of home life; tired of constantly nursing my aching body along; and, quite frankly, tired of having to ride. I did take advantage of some beautiful weather and lazily hacked Remy a couple of times a week, but mostly I reveled in all the free time I had and the immediate reduction of a lot of stress coursing through my body. Ahhhhh…it would be so easy not to compete anymore! Two or three weeks pass, and I know I have recovered when I realize the start of a new competition season is a looonnnggg way away and I am already thinking about what we need to be doing to prepare ourselves for the next challenge. I also notice that I am getting cranky and impatient - sure signs that I am missing the stress-relief that riding gives me; I’m lucky if I can focus on one thing at a time, so if it’s my ride, nothing else is intruding and I come away mentally refreshed. I have always loved horses - and spent quite few happy and rewarding years as my daughter’s groom - but I know myself well enough to accept that it is the competition at the end of the rainbow that fuels my fire – the training and conditioning, the management of the horse’s physical and mental well-being, the grooming and turnout aspects, and yes, the selection and maintenance of all that tack and equipment! I do not see myself as a happy-hacker – EVER; if I’m not working toward a specific goal, I’m not going to bother at all. There are way too many other things I could (and probably should) be doing to spend all this time mucking about to get a little fresh air! Like many of us, I have first-hand experience at how fragile life is and how quickly your life can change. So, for as long as I have the desire and the opportunity, I will continue to ride and compete – and I’ll try not to complain about the time involved, the fatigue, the stress, and the aches and pains…until at least the end of NEXT season! As the latest and greatest blankets hit the store shelves, I re-examine the blankets I use on my own horses – and why. The blanket I get the most use from all year round is my Ecogold Air-Knit Cooler. This honeycomb-type fabric is the most effective cooler I’ve ever used to dry a wet horse - letting air circulate around the horse without allowing him to get chilled. It isn't too heavy for any but the hottest weather, so I often use it as a travelling blanket; if my horse sweats up a bit when shipping he doesn’t overheat and he can then cool down without getting cold. The downside is it is white, so it's a bit stained as it's been left on in the stall and out in the paddock at times! They are easy to wash in the machine and quick to dry, long-lasting (I’ve had mine over 10 years) and the bit of stretch to the material seems to be comfortable on the horse. I understand Ecogold doesn't make them anymore, but Horseware has recently come out with the AirMax cooler. It's the one cooler I wouldn`t give up. 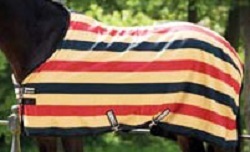 I think the Rambo line of blankets from Horseware are designed really well, so my favorite stable sheet and blanket are the Rambo Newmarket ones. They have changed from the stripes to solid colours, and 'upgraded' the lining from a polyester (which didn`t rub or cause static electricity) to a type of microfiber that is nice and smooth - so far they seem to be performing well. They are lightweight and fit in my standard washing machine easily, and they dry quickly when hung up. The blankets that a horse wears for long periods of time are the most critical to get a really good fit on or you are asking for rubs, rips, and possibly a very cranky horse. The neck and shoulder area are the most important, and gussets and a lot of adjustment are not always necessary if the shape is correct to start with. The different manufacturers tend to work with similar patterns for their various models, so when you find a company that makes one that fits your horse well, you are likely to have success with others in their line-up - my rainsheet is also from Horseware, a Rhino Wug. The last of my favourites (for now!) 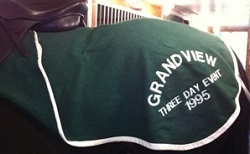 is an old Melton wool quarter sheet won at the Grandview Event in 1995. 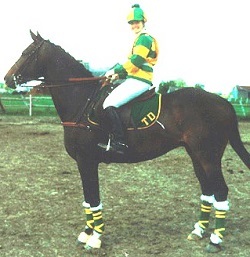 It happened to be hunter green (my stable colours) and the medium size has worked on all my horses. It is the old-style square version rather than the key-hole type you can remove, but I'm only using it on clipped horses or when it's really cold, so I tend to leave it on while I ride anyway. It's a good weight and I don't have to worry about static electricity like you can get from some of the lovely fleece blankets. I wash it once or twice a year in cold water with a mild detergent on the gentle cycle, and hang it up to dry. I admit that it has considerable sentimental value, and can be a bit of a motivational tool when tacking up for a schooling session on a dark, frigid day in February! As a new show season gets underway, safety should be a primary concern. Working with and riding horses always carries an element of risk, even in the relaxed and familiar surroundings of home. When we decide to take the horse out of his comfort zone, add in a rider dealing with a certain level of stress and then mix in the physically taxing effort of the actual competition - 'presto!' - our risk level has suddenly increased, sometimes beyond our control. Everyone, from the rulemakers to the grooms, plays a part in ensuring the safest possible environment for the horse & rider to perform to their maximum potential. Many rules, while not immediately obvious, were drafted to ensure the safety of all participants - from helmet use, to qualification requirements, to how medications may be used. The soundness of your horse and condition of his feet are overseen by your vet and farrier; whoever feeds and handles your horse on a daily basis should have a pretty good idea as to his general physical and mental well-being. Your coach helps you decide on the appropriate level of competition for your abilities, and the show management has a mandate to provide safe facilities for the competition itself. Every other participant contributes by ensuring their horse is at an appropriate level of training and under sufficient control that they do not jeopardize others in the area. Ultimately though, (except at the most novice level) it is the rider's responsibility to ensure his and his horse's safety while competing. Despite all the conditioning, training, and preparation that goes into entering the jumper ring or start box, it is the rider who must be aware of how the horse and rider are coping with the demands of the course on that day and make appropriate decisions. In many instances only the rider can feel that the horse isn't quite himself; for example, whether he feels sluggish, is not quite regular in his stride, is lacking confidence, or is too aggressive and strong to control effectively. It is the rider who knows how he himself is feeling - tired or energized, focused or distracted, confident or apprehensive - and while a large part of competing successfully involves learning to cope with and modify these feelings, a rider must use his head and in some cases accept that, at least on that day, "it ain't working", and they are better off withdrawing and working out the problems before the next competition, or reducing the challenge to a more manageable level for that day. As a wise and experienced Eventing coach once told me, from a safety point of view, "it's better to move up a year too late than one competition too early". There is no shame in doing what you feel is the right thing for yourself and your horse, and there is always another show or event - providing you and your horse are both in one piece! Knitted Wither Pad - I'll begin with this only because it's the oldest item on today's list. This is an item that isn't seen that often anymore, probably because there are so many other more modern, high-tech, or cheaper alternatives out there. I would also like to think that people pay more attention to correct saddle fit, resulting in less of a demand for this 'band-aid' solution. They were once widely used on mostly Thoroughbred-type horses with high withers, on top of a regular saddle pad, to give the saddle a little extra clearance in front. Mine is used only infrequently, for short periods of time when my saddle needs a bit of a lift in front, but it is a simple and effective way for me to correctly balance my saddle while I wait for Vicky to squeeze me into her busy schedule! 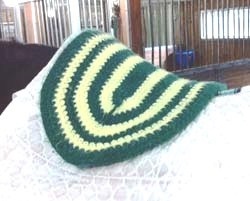 My wither pad is in my stable colours of hunter green and yellow, and is just the right thickness, size, and softness to do exactly what I need it to do. A classic. NuuMed Saddle Pads - Truth be told, I'm almost sick of these pads, and I when I see some of the new pads coming into the store in great colours, incorporating new fabrics and technical features, I am sorely tempted to put my stack of boring pads aside and spice up my life - but I can't. 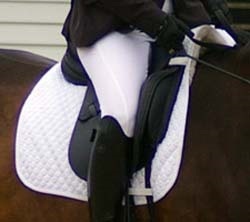 I use the SP01 - a square cotton-quilted pad with pure wool lining against the horse's back under the seat of the saddle only. The sheepswool is not still on the (sheep's) skin, so the pads are easy to machine wash, yet the most important benefits of sheepskin - temperature-regulation and pressure distribution - are maintained. 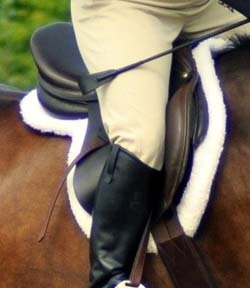 The shape of the 'topline' of the pads prevent any wither pressure, or friction behind the saddle at the edge of the pad. The girth loops are correctly placed and the attachment to the D-rings on a dressage saddle (or billets on a jumping saddle) keep the pad from shifting, though only in competition do I even bother to use the attachments. My pads have lasted for years - I fluff up the wool with a currycomb or stiff brush before each ride and wash them about once every 4 or 5 rides. They look good, keep my horse's back comfortable, and last (and last...and last...) 'Nuf said. 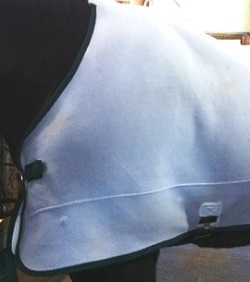 Non-Slip Hunter Pads - I love the look of a correctly-fitting shaped fleece pad, and HATE the look of one that is the wrong size, shape, or has slipped. The Ecogold Hunter pad is reserved strictly for showing, as I do find the heat builds up a bit underneath and they are not the easiest to keep in pristine condition despite being machine washable. These pads are really great for horses or ponies who are round in the body and on whom the saddle may shift a little from side-to-side, as the pad is non-slip on both sides and won`t slide around on the back of the horse. The EquineLUX pad is non-slip on the surface only - preventing the pad moving underneath the saddle, but against the horse`s back is a nice grey cotton fabric, which is a little cooler than the Ecogold, but doesn`t grip the horse`s back the same way, making it better suited to horses whose saddles don`t slide around. With either choice, once you put one on - they don't move! In fact, you need to make sure the saddle and pad are perfectly positioned when you tack up because THEY DON'T MOVE! I think George Morris would approve. "That's it! ", I thought. 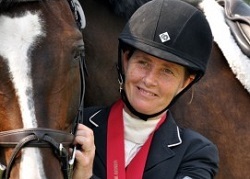 "I'm giving up jumping and will just focus on dressage." I felt a huge weight lift off my shoulders. I had just returned from a spring Eventing clinic, and though Remy performed all the exercises well, we weren't enjoying ourselves. Too much tension, too much stress, too many things to worry about. I announced my big decision to my stunned friends and family, spent three days poring over show schedules and imagining perfect shoulder-ins - and realized the solution was not to give up the sport I loved because I couldn't deal with the pressure I was putting myself under. Unfortunately, I wasn't clear on exactly what the problem was, which made finding the solution a little more challenging! For many years I trained and competed several horses to Preliminary level and was, I thought, a pretty competent amateur trainer and rider. But, after a break of almost 10 years, and a new young horse, I was finding myself over my head and feeling completely frustrated. I knew I had more than one issue to deal with and realized that in order to move forward I was going to have to take a step back. I decided to put the idea of competing on hold until I figured out what was wrong and how to fix it - and so began perhaps the most interesting, enlightening, and rewarding summer of my long relationship with horses. I knew I had some confidence issues: I knew I was capable of riding well, but I was becoming more concerned with not making a mistake than I was with riding pro-actively. I also felt very self-conscious; many people in the area know who I am and also know I am relatively experienced, so I felt everything I did was being critiqued by a thousand people. I do, of course, realize that the only people paying the least bit of attention to anything I was doing were (hopefully) my coach, and (possibly) a couple of friends who wouldn't have noticed if I had jumped an entire course backwards! Nerves would interfere with my ability to focus on the task at hand so much that I would come out of the ring and have absolutely no idea what had just transpired. Fate intervened to help me out - a friend introduced me to her sister-in-law, Sommer Christie, who happens to be a Sports Psychologist with an impressive resume and an interest in working with riders. We scheduled some seminars at Sandridge and they helped me enormously; many small techniques and tips that allowed me to get better control of my nerves which enabled me to both ride AND think at the same time. Problem one addressed! Aside from the problems within my brain, there were problems with my communication with my horse. Remy is quite different from the strong, 'point-and-shoot' Thoroughbreds I had ridden in the past. He is very quick and sensitive, but also somewhat lazy; if I don't create some kind of rhythm on course, we gradually are going nowhere - which I discovered is a hard distance to jump from! He would land strong and get on the forehand, dragging me out of the saddle and going around most corners disunited (if I was not lucky enough to be on the wrong lead entirely! ), but would then stall and get behind my leg, approaching the next jump without any pace. Although I was taking lessons, I realized there was some sort of disconnect going on and I needed more help, so, for the first time in my riding career, I arranged to have one of my coaches school my horse. Well, not only was Holly able to stop what what he was doing wrong, but she was able to communicate to him in a way he understood how it should be done. In very short order the pieces of the puzzle were starting to fit together, and every ride became more productive and less frustrating for all of us. The final problem (and possibly the biggest one) actually became apparent to me in a dream (I'm not making this up!). I dreamed that I fell off Remy at a show in the middle of a busy city (well, it WAS a dream...) and he ran around wreaking havoc - running over people and kicking cars and jumping baby carriages and so forth. I woke up shaking and honestly thinking I'd have to get rid of him! The dream had not come out of the blue; the few times I have come off Remy he has taken off at a flat-out gallop, with no apparent regard for anything in his path, and the dream made me acknowledge how very concerned I was about the possible damage he could do if I couldn't instill in him the confidence and trust to stay with me (both physically and mentally) when things got stressful for him. Enter 'guru' number 3, Charles-Etienne Menard (formerly of Cavalia) who had come highly-recommended by a close friend who had been dealing with similar issues. I am not a touchy-feely kind of person; I believe the 'horse whisperers' of the world who are any good are actually "just" very perceptive and patient horsemen, and I was desperate enough to give this approach a try. From the first session, I could see a difference in Remy's focus and calmness, so we continued to work out issues and test his training once or twice a week, including work in the saddle. I spent a very self-indulgent 6 weeks or so having sessions with Charles-Etienne, my very perceptive dressage coach, Jackie, and having Remy schooled once every couple of weeks. Gradually, I began relaxing enough that I could think about what was happening and apply my experience to problem-solving the immediate issue. Remy was calmer, seeming to take a moment to think before reacting, and when he did spook or was stressed, I found I could 'talk him off the ledge' much more quickly - finally, it seemed, we were becoming a team. It was time to go out and test the work we had done. Our first event was in mid-August, and for the first time, Remy won the dressage, and proceeded to jump perfectly to finish without any more penalties. There were some nerves; Remy was quite tense before the dressage, but with Jackie's help we did the exercises that focused his attention on me. Before Stadium (my most anxiety-provoking phase), I was again pretty nervous and dealing with a migraine, but Sommer was on hand and kept my mind from drifting to non-productive areas. It was a successful outing but I still wasn't entirely comfortable, so the work continued. Our second and last event was to be the Jeux Equestres, the Provincial Finals, at Bromont, Quebec - what I felt would be a huge test of our groundwork in particular as Bromont is a very busy and exciting venue. I made very sure I was totally organized and clear on scheduling. From the moment we arrived it was apparent things had changed - BIG TIME! I had a relaxed horse in the stable; I could ride or lead him anywhere on the grounds, and while he was interested in what was going on, he stayed attentive to me. Our schooling sessions went well, and even a change in the schedule, moving Stadium to before Cross-Country didn't faze me. In the Dressage, I had tears running down my cheeks at my final halt at 'X'; while there were a couple of mistakes in the test, I RODE my horse, and he responded! Stadium provided similar joy - for the first time with this horse, I performed a relaxed stadium round where I thought about what I was doing and was able to make corrections on course. After all that, Cross-Country was a snap, and instead of just being on the usual adrenaline high of completing a fault-free course, I was actually sorry there weren't more jumps to do as we approached the finish! The entire competition was the perfect reward to all the effort that had gone into figuring out what our problems were and taking the necessary steps to solve them - and a lot more interesting than I suspect doing 20 dressage tests might have been! My name is Tracey and I am a Tackaholic. Very soon after my addiction to horses was acknowledged, it became apparent that the paraphernalia that surrounded them also fascinated me. It must be some weird personality quirk - I'm also interested in the equipment used in other sports (hockey goalies are gold!) and in everday life (at a concert I'll be watching the drummer and wondering about the set-up and what makes each of those drums sound different). My model horses, Flame, Thunderbolt, and the others, had bridles carefully made of wool, bits and stirrups formed from picture-hanging wire, and saddles cut from the suede patches meant for the well-worn elbows of men's tweed jackets. Nevermind swiping candy bars, my childhood foray into crime was cut short when I was caught stealing a leather cat harness I thought would make a terrific training harness for Blaze. I began a journal when I got my first pony at age 13 and it amazes me to this day how much thought went into the selection and evaluation of the stuff I collected. An entire section of the book is dedicated to 'Tack and Costs', with entries like, "April 23 - Purchased snaffle bridle, made in India. Laced reins, studded. $ 17.95", and, " I want to try Penney in a rubber Tom Thumb because I would like better control, but not a hard mouth. Or else a Fulmer or a thick eggbutt snaffle". In the beginning, more was always better, and the greater the colour-coordination, the better the effect. I sometimes wonder if my affinity for Eventing didn't have more to do with the variety of outfits I got to dress up in and the vast amount of equipment required than the excitement offered by all that galloping and jumping. (Dressage didn't really count - it was just something to endure to get to the fun parts). I got a 'dream job' one summer when I was in my mid teens, working for a lady who had a tiny tack shop, half a dozen horses, and a small piece of property on which she gave riding lessons on the weekends. My job was to look after the horses during the week, which I loved. I loved it even more when I discovered the saddlery supplier catalogues, and I suspect that's when the germ of the idea of owning a tack shop was planted. I did finish university with a degree in Political Science, with the idea of going into law. The horses were still a bit of an impediment I guess, as I really didn't want to be far from the farm and so only applied to one law school - McGill. Not surprisingly, I wasn't accepted, so was forced to go to Plan B: open a tack shop. I was, and still am, very fortunate in the moral and financial support I have received over the years from my Dad, without whose help this crazy venture would not have worked. 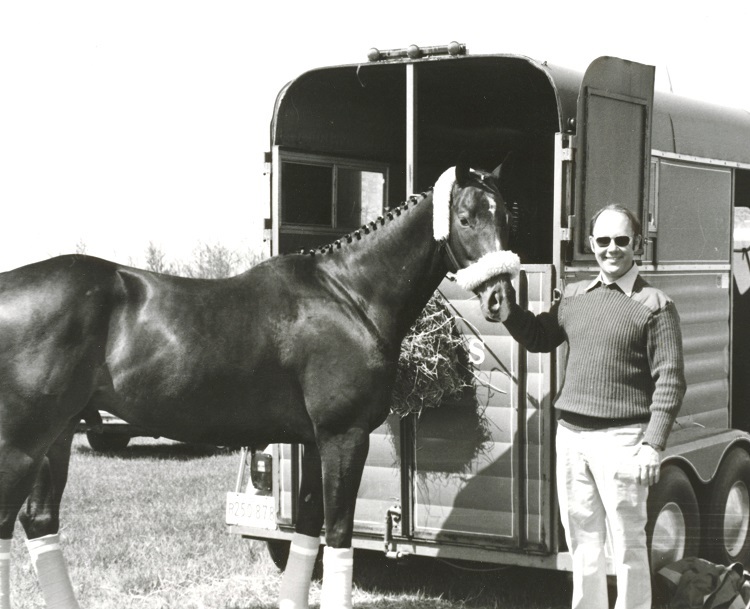 25+ years later, I have seen a lot of changes in the horse world and the tack business. For example, when I first started, 'inexpensive' meant 'cheap', and most leather items coming from India could almost have been considered disposable, and those from Argentina were not a huge step up. I still occasionally have a customer sagely advise me that they won't even look at a sadddle from Argentina "because the trees all spread". At one time this was not far off the mark; nowadays many of the most well-respected and recognized saddlery brands in the world are manufacturing most of their products out of India, China, or Argentina to take advantage of low labour costs. When I began, the gap in quality between the cheapest bridle and the most expensive was huge; the price difference, relatively speaking, was not as great as it is today. The low-end bridle I bought for Penney in 1973 was $ 17.95; for less than two hundred dollars more I could have had pretty close to the best quality available. Today, the least expensive bridles start at about $ 30.00 and the most expensive can easily reach $1,500.00! If you knock out the very lowest and the very highest now, I would argue that the quality difference is not as great as the price difference might suggest; bridles from reputable companies in the $ 100.00 - 200.00 range will likely not vary tremendously in leather quality and workmanship, similarly, in the $ 200.00 - 400.00 range you will likely be looking at minor variances. The 'name' attached to a line of bridles, the fit and sizing, and the styles offered should detemine which bridle is chosen more than the expectation of a significant increase in quality within a range. The horse owner benefits with a much better selection of mid-priced products now than ever before. Modern manufacturers are very competitive and are able to copy popular 'high-end' items quite quickly and acurately, and whether it is a blanket, a bit, or a girth, the consistancy of quality is being controlled much more closely than in the past. At the same time, I feel that the overall quality and value-for-money at the higher price points, at least in leather goods, often leave something to be desired. The days are over when you could buy a good saddle and, with very little maintenance, expect it to last for 30 years. The upside there is that we are usually sick of looking at the same piece of equipment long before that, and it gives us the excuse to try the latest and greatest replacement that has just arrived on the scene! With my own horses, I have evolved into a tack snob. I am concerned with three things: Function (there must be a need for the piece of equipment), Fit (I am obsessive about getting as close to a perfect fit as is possible), and lastly, Form - the aesthetics of the item; how it looks and feels. Luckily, I am in a position where I can experiment with anything that comes in the store and can order anything that looks interesting. Not a bad job for one with my 'disease'! I remember very well the day Sandridge received its first big delivery of equipment from England - I was alone in the store with empty shelves, surrounded by a dozen boxes filled with the stuff of my dreams. Every item was admired, smelled, and lovingly placed on a hook or a shelf. (Some of those items are STILL on those hooks, but that's a story for another day). I have to admit that, even after more than 25 years and too many cartons to count, I still get excited when something new is delivered to our door. "Another lessson?" My husband is incredulous. "You've been riding for over 40 years. I would have thought you'd have learned how to do it by now!" I sigh and then proceed to try to explain for the umpteenth time what the differences and similarities are between riding a horse and any other sport that he 'gets', "Look at professional hockey players", I say, " they still have practices, coaches, trainers and therapists and yet they certainly know how to play hockey". "Yes", he responds, "but you aren't an elite athlete; you've already competed at higher levels than you are now." I try again with golf, in that once the basics are mastered - and really, what could be so difficult about whacking a little ball into a hole? - practice is required to maintain or improve a skill level. Every golfer must overcome the challenges posed by weather conditions and different courses, but let's now give the golf ball a mind of it's own and we're starting to give two sports a similar level of complexity! I believe training and riding a horse well is unique because it involves trying to merge with a different species - one whose instincts, methods of communication and goals are not the same as ours. When I began riding, Job 1 was to remain in the saddle. Then we moved on to steering, to speed up and slow down, and finally, to jump. Then came further refinement of technique, which continues to this day; to increase and decrease within a gait; to go sideways as well as forward; to alter flexion and bend; to jump more technical courses. At this point, I would say, okay, I can now ride a horse. Now the challenge is not to ride A horse well, it is to be able to ride ANY horse well. The training and riding process is so interesting, frustrating, and (hopefully) rewarding is because every horse is different. Temperament, conformation, health and soundness, feeding and exercise levels, and previous training and experiences all contribute to the makeup of a particular horse. Figuring out how the various factors influence that horse's behaviour and responses is what keeps the goal of being a good rider and trainer fresh and interesting even for those with decades of experience. There is always room for improvement; we can always be smoother, more subtle, quieter in our communication. The longer I have ridden, the more I have come to appreciate how really difficult it is to do well, on a consistent basis, with a variety of horses. It can be incredibly frustrating and incredibly rewarding (even, at times, within the same session on the same horse!). The occasional "ah ha!" moment is worth many hours of experimentation and practice; as long as they keep coming, I'll keep saddling up.